Marina thought that she had solved all of the Arclight’s mysteries. She had found her own history—that she was one of the Fade, that she never should have been human. She knows that the Fade who surround the Arclight don’t want to be the humans' enemies at all. She knows that the leader of those inside the Arc, Honoria Whit, never told the whole truth. But there is so much more that Marina is just discovering. There are more survivors out there. Only Marina—and her friends, all of whom have connections to the Fade they'd never known about—can lead her people to them. But there are also darker dangers, things that even the Fade fear. And Marina slowly realizes she may never have been “cured,” after all. 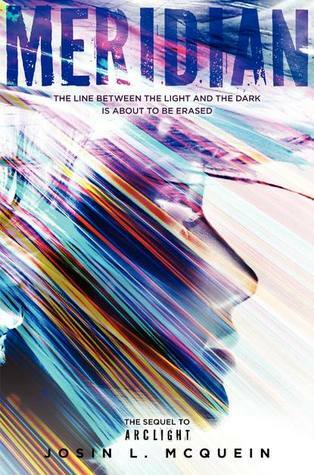 The sequel to Arclight, Meridian is an intense, action-packed page-turner about the lines we draw between right and wrong, light and dark . . . and the way nothing is ever that black and white. This series! It is so creepy and so awesome! I loved how the world in Median has expanded and we get to go outside of the Grey, outside of the Dark, and even farther! We get a better idea of the history of how everything happened and are taken on an awesome (and scary!) adventure. The Arclight series is absolutely one of my favorites- it is so completely different to everything else out there. I hands down recommend it to anyone and I can't wait for the next book- if it is a good as this one, I expect many nightmares and many lamps on in my house!